Happy Halloweening (late, clearly) and happy almost time till no more election commercials, calls, obnoxious people storming in my house. Honestly? I don’t know which I am more excited about. Anyhoo…despite all evidence to the contrary and my utter lack of coordination-I am pretty crafty. WAIT-not in the diabolical plotting a world takeover where everything is covered in sparkles way but in a crafty glue and scissors and everything is covered in sparkles way. Relieved? I don’t normally enter contests, because I so rarely win, BUT my camera is dying and this seemed easier than going out and buying one. You know, cause I’m on my couch. In pj’s. So I am entering the SITS’ girls Halloween contest. AND I would have posted about my fantabulous costume ANYWAYS because it is ALL sparkles and stars and tulle. You can’t tell from the photo, sadly, but due to almost asphyxiating myself with a bad can of spray glitter-my hair and face were so full of gold and silver sparkles that I was actually TRANSFIXED by my reflection. For reals. ANYWAYS-I made my earrings out of cheap Christmas ornaments from Hobby Lobby, made 18 stars to float around my head by gluing acrylic star jewels to bobby pins with little discs on the end and the skirt is made out of about 12 yards of different colored tulle gathered together and stitched to a ribbon. The stars on my face, and inner corners of my eyes which you can’t see, are self-adhesive scrapbooking stars of varying sizes that I peeled and stuck to my face-shockingly my sensitive skin didn’t revolt. I had on glitter liquid eyeliner and false eyelashes with glitter throughout them. I was almost blinded upon several occasions. I didn’t learn my lesson from the glitter eyelash gloss (really a bad idea when driving at night-headlights make sparkles in your eyes and it’s like you’re having some sort of fit) and glittered up my eyes LOTS. Add in strobe lights and other crazy Halloween-ish effects and it’s a miracle I stood upright all night. The sequin shoes, cami and sequin trimmed cardigan were all things I already owned (Tahari, Express and J Crew respectively) so I just incorporated those. Also? Everyone ASSUMED I was a bad fairy…rather than just a night fairy. I don’t know why people would think that. 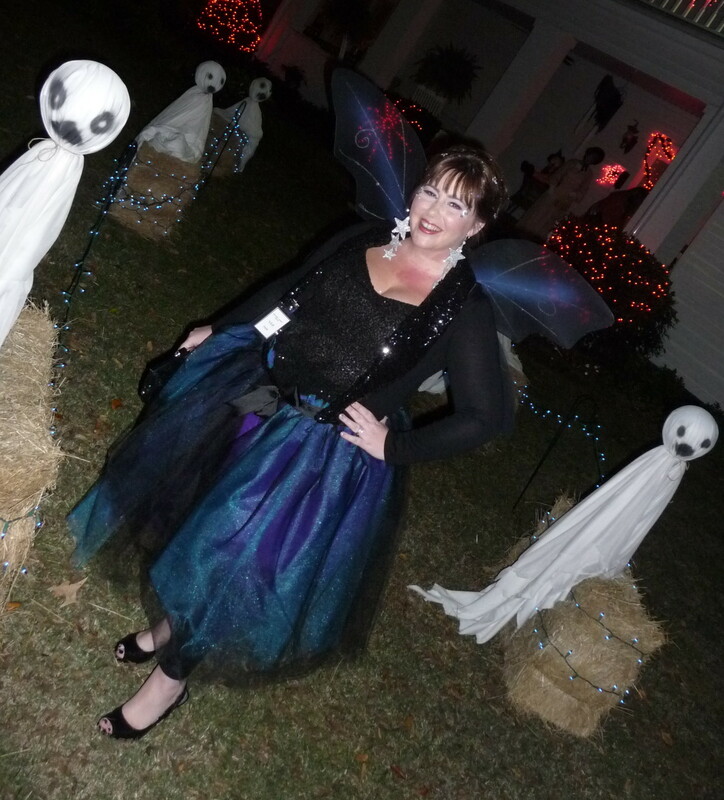 I don’t think bad fairies are quite as covered in sparkles as I was. SO…there’s my costume. What did you dress up as? What was the best costume you saw? (You can totally say your own) If you posted about Halloween costumes, share a link in the comments so I can check them out. Also…please click the facebook badge on the right over there to like me on facebook. You don’t HAVE to like me on real life-on facebook will do so no pressure. Another also? Please click the juggly cartoon chick in the brown box, also handily hanging out on the right, and vote for me. Once a day would be superness. Sidenote or also or p.s.s? I have decided to participate in nanowrimo. I do realize this will probably wreak havoc on my dvr and tv schedule as well as my general layaboutness and I have NO idea how to go about it but I still owe an agent a first chapter…so starting tomorrow because I sort of forgot today was Nov. 1. And? I’m sick. I went outside for longer than 5 minutes Saturday night so OF COURSE I’m ill. Being outdoors has that affect on me. You rocked the night fairy!!!! I am so not good at costuming. Cool costume! You look great! Wow! Amy, you look great. Very creative! Is that your home?! I saw a really good Lady Gaga that was my fave. I was an Indian princess warrior…my hubs picked it out for me! Love Halloween and am devouring all the pictures. I was not aware there was such a thing as a “Bad Fairy”? I absolutely LOVE the Carol Kane fairy character in Scrooged! Sparkle On! You know what? You look beautiful. You remind me so much of beautiful Jen Lancaster. Love that costume. Can I have it next year? I went as a Tired Mom. Original, huh? Also, required no work on my part, other than looking sick (which I was) and tired (which I was) and forgetting to iron my shirt (unlike every other day). I have no clue what I’m doing either…but maybe by Nov.3o we will. Till then? Fake it till you make it, baby! I love your costume lady! I’ve always wanted to be a fairy for Halloween!